The petals of a flower considered as a group or unit and usually of a color other than green; the inner whorl of the perianth. PERIANTH — n.The outer envelope of a flower, consisting of either the calyx or the corolla, or both. 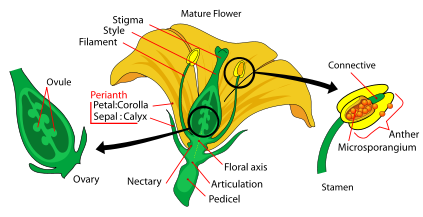 SEPAL — n.One of the separate, usually green parts forming the calyx of a flower. This is a nice little vowel progression puzzle. Three of the five theme answers are quite fresh and lovely (1, 2, 5), and the others are just fine (3, 4). The trick with this simple concept is to make sure your theme answers don't just fit the pattern, but charm, amuse, and entertain. If they're not fresh and interesting, then your progression comes off as a sad little yawny exercise. The fill here is a net plus, with the banks of biggish words in the corners providing something in the way of unusualness, and with not a lot of terrible short stuff gunking up the grid. There is some tepidity here and there (USERFEE, TOPSEED, SERENER), but surrounding fill more than makes up for it. Any time a Monday puzzle takes me more than 3 minutes, that means it's leaning tough for me. Today, the longer Downs (which required a few crosses in most cases) were enough to ensure a little slowage, and then there were some clues that seemed less-than-straightforward. [Flower part] was vague enough that I had to cross it many times to pick it up. Had to think about both "Dating Game" clues (what a weird, wonderful little clue pairing that was). [Disentangled] didn't get me to UNDID without almost all of the crosses. I don't (readily) think of a "You Are Here" MAP as a "Poster" … But overall, it evened out to normal Monday difficulty level. Solid stuff. Thumbs up. Enjoy the hot week ahead (at least in the NE). I will be spending my days in library coolness, except when I'm yelling at soccer, but at least then I'll have my friend beer. n., pl., -ros (-rōz', -rōs'). A rogue or adventurer. Also called picaroon. The main character in a picaresque work when that character is a man or boy. Phew. As I wrote on my Facebook page last night, I was all set to knock this one out while the pizza was in the oven (timer on 11 minutes), but then I saw Byron Walden's name and immediately aborted that plan. Pizza would've burned, I reasoned. And turns out I was right—took me somewhere north of 14, longish for me. I didn't see the EL CID thing til the very end, so I had no idea how many of these right-turners were coming or even exactly where they were. CANON I … sounded plausible as an answer for 13D: Pachelbel classic, familiarly, even though that usage wasn't "familiar" to me. Anyway, the whole thing felt like a bit of a minefield, plus the cluing was on the tough side. This is all to the good, though, as I found the solving experience predominantly enjoyable. CRISIS IN DARFUR and COVERED IN DUST felt a *little* contrived/arbitrary as self-standing phrases, but not so much that it hurt, and considering the very high bar set by the theme (six C.I.D. phrases), I am happy to let those pass right on by. The fill here is mostly solid and graceful (I'm just ignoring AAAA … though it pairs nicely with BBB). There's also tons of interesting little tidbits throughout, like MS. PAC-MAN and I HAD A HUNCH and PADDED BRA and HOG CALLER and MOSH PIT and whatever SEA HOLLY (12D: European coastal plant once thought to be an aphrodisiac) and SPIKED ACES (17D: Ray-finned fishes of the Southwest U.S.) are (whoops, that's just one word: SPIKEDACES). There were all kinds of pesky little stumbling blocks in this one. Right out of the box I face-planted on 4D: Quince, e.g.. I can see a "due" misdirect coming a mile away, but got blind-sided by the Spanish word for "fifteen." Had BANTER for BICKER. Imagined Hollywood was in CA and not FLA. And on and on. Highly pleasing—one of the best NYT Sundays I've done in a while (not the highest bar, but still, dang good). 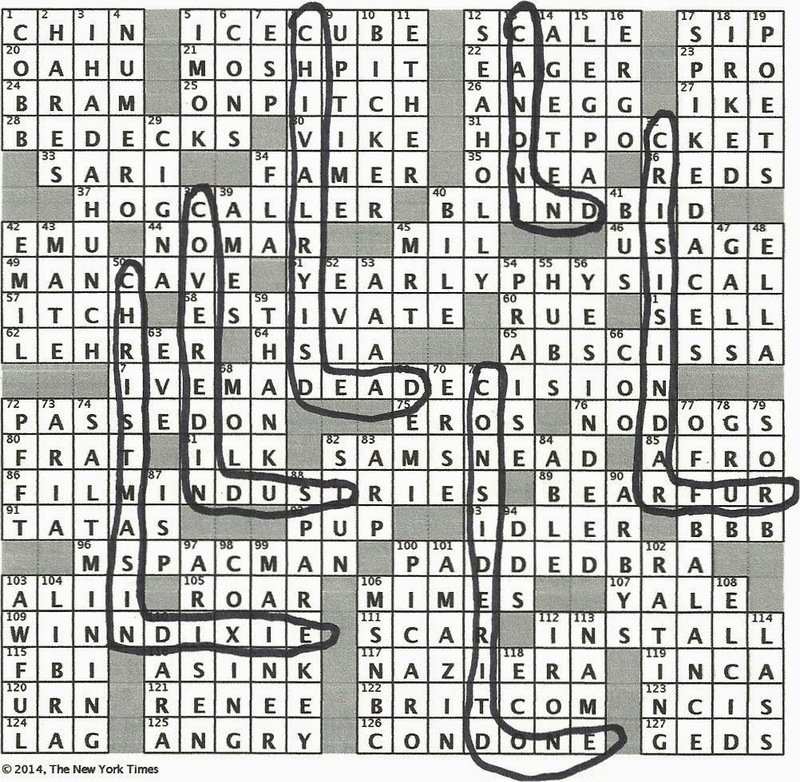 Puzzle of the Week goes to Zoe Wheeler this week for her American Values Club Puzzle, "Flexibility" (get it here for $1 / read about it here). The AVC is starting to pull away from the pack a little in terms of overall quality (though every week Fireball is right there too). Zoe's puzzle just has a perfect reveal—theme elements are a great visual representation of a well-known expression. You can't ask much more from a themed puzzle—especially from a relatively easy themed puzzle. Easy- to Medium-difficulty themed puzzles are some of the hardest to do well. Cleverness and easiness are tough to combine. Not that American Values Club puzzles are "easy"—they tend to run in the Wed.-to-Fri. level range for me. But Fireball puzzles (also great) tend to be routinely Saturday-hard, so the two puzzles contrast one another a bit, and together provide nice coverage of the themed puzzle difficulty gamut. Nearly every week I find myself solving AVC and Fireball and thinking, "this would've made a good NYT Thursday." Perfectly adequate Saturday fare. I felt like the showier answers fell flat because they all felt like things I'd seen in themeless puzzles before. 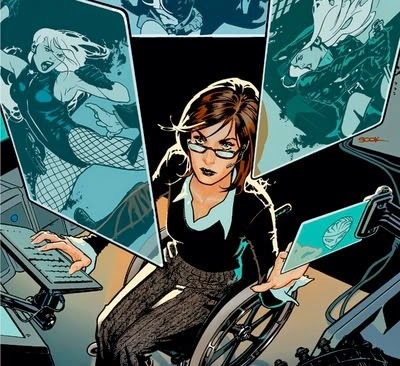 Like … things that would've been impressive a decade ago (XRAY VISION, KAFKAESQUE, AZERBAIJAN, etc.). I mean, those are perfectly good answers, but they are also about where this grid maxes out, interest-wise, so the wow factor was minimal. I actually found some of the less showy stuff, like ARE YOU SURE? and START SMALL, more impressive, because they seemed like fresh interesting colloquialisms. But overall everything seemed just fine—Saturdayesque. 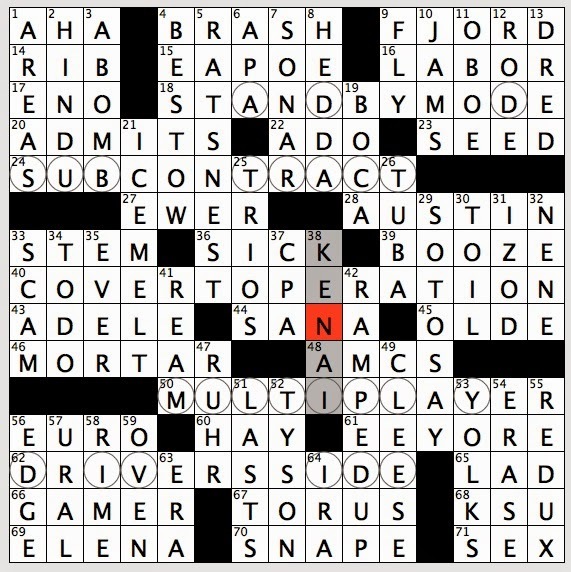 Clean grid, light on the junk, interesting answers, appropriate difficulty level. But nothing really gives the puzzle personality or makes it memorable. I stared by running the short Downs up top, only I went AGEE instead of PUZO at 2D: Two-time Oscar-winning screenwriter, so despite having many others right, I got a bit stuck. First real coup was getting TSING-TAO, with no crosses (7D: Beer named for a port on the Yellow Sea). This got me OCT and ABCTV, and then ECO allowed me to shoot VACCINES across the grid, and from there I had footholds galore. Well, a couple. Muffed it by writing in CDRACK instead of CDCASE (49D: Obsolescent media holder). So the media is obsolescent, not the holder? For some reason, the rack strikes me a amore obsolescent, but the clue does seem valid. SW corner was very easy to get into because of the piece of cake clue on B FLAT MAJOR (27D: Key of Schumann's Symphony No. 1). No, I didn't know the key, but I had the B, and … what else was it going to be. I wrote in B FLAT M--OR instantly. JUNE gave me MAJOR. Rest of the corner went up in smoke. Had the most trouble with TEE ZED, specifically the TEE part. 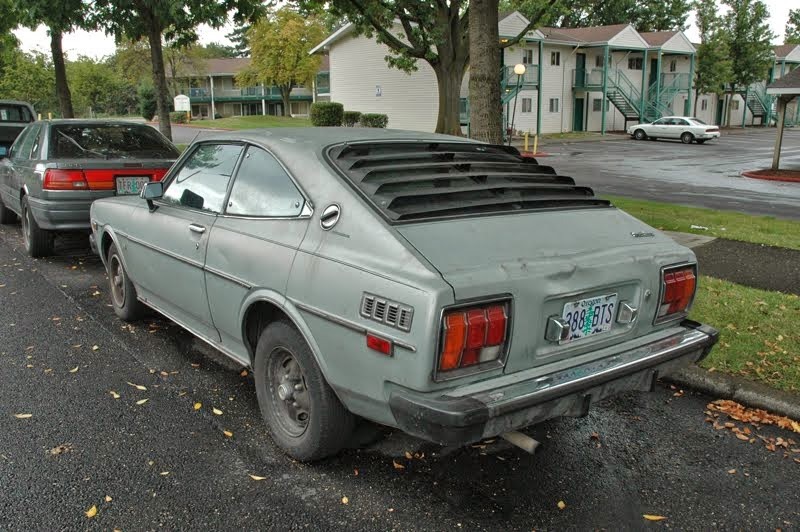 I was sure (for quite a while) that it was THE ZED, which I almost liked for its insanity. 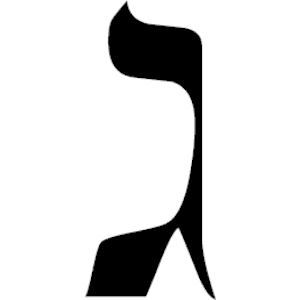 The third letter of the Hebrew alphabet. A pretty nice puzzle that started out breezy and then got very bumpy toward the end. This is an interesting grid shape, with three grid-spanners going Across and one going Down, and then sizable banks of mid-length answers in the corners. This results in a grid that feels paradoxically both wide open and very choppy. 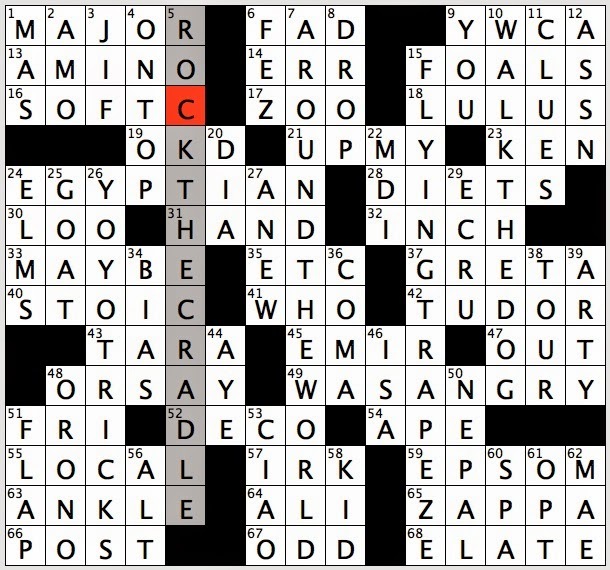 There were probably more crosswordy answers than I normally like—not crosswordese, exactly, but stuff (mostly proper nouns) that I know only because I've done a million crosswords: UGARTE and ELY and PETRA and (esp.) EL ORO (24D: Ecuadorean province named for its gold production), the last of which I technically only vaguely remembered. "Ecuadorean province" is pretty much quintessential Maleska-era clue language, i.e. rank arcana. But these are spaced out and not too offensive. I'd say the cluing was as much the source of pleasure in this puzzle as the words themselves. [Celebrates wordlessly] had me thinking "silence"—wrong (APPLAUDS). I couldn't get my head around what part of speech "Cry" was in [Cry when rubbing it in], so TOLD YA came as a nice surprise (one I figured out only after going "wait, nothing ends in '-DYA'…"). 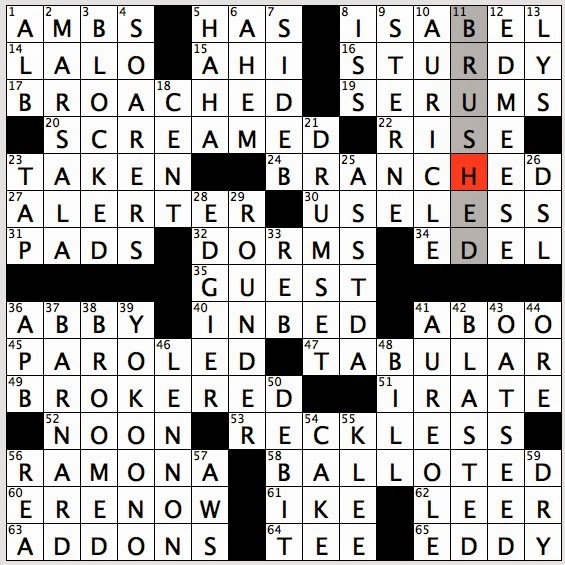 Even ET TU got a decent, surprising clue (31A: Surprising words from Shakespeare? ), though the words are more "surprised" than "surprising" (which is, I guess, why the clue has a "?"). The most unfortunate part of my solve was that the answer that held me up the most, that caused me to stall out the longest, was also manifestly the worst answer in the grid: ITHAS (41A: "___ to be!"). I see how this works as a partial. Now. But not then. It's pretty tortured as partials go. And I just stared at "-HAS" for what felt like ever. Because I couldn't imagine an answer there, the whole lower middle got held up. 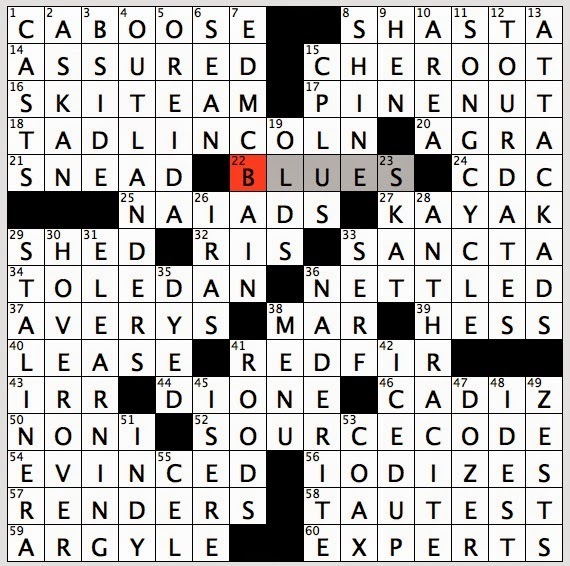 The other problem was that HOT AS BLUE BLAZES was not coming to me (47A: Sizzling)—that phrase happens to be weirdest right in the middle, i.e. right in the place where I was having trouble because of nearby ITHAS. I could see BLAZES were probably involved because I had the "Z," and I got HOT pretty easily, but I wanted HOTTER THAN BLAZES (doesn't fit). So between ITHAS and the middle of the BLAZES phrase and the tough clue on TOLDYA, I got bogged down. But I still like the grid, for the most part, and thought it was clued with a good Friday amount of difficulty and cleverness. Wrong answers: DUNS (?) for BUMS (7A: Borrows without intending to repay) … I think that's it. I had some terrible *ideas* (SCRIBE for SCREEN, ICBM for STEN, EXE for ELY) but I didn't actually write any of them in. 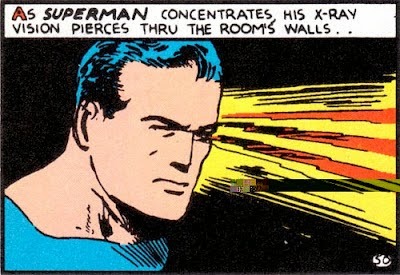 The outer projecting portion of the ear. Also called pinna. Biology. An earlobe-shaped part, process, or appendage, especially at the base of an organ. Didn't care for this one much. Results of the em-BED-dening are just random, unclued words, and (monotonously) past tenses of verbs in Every Case. BED is always divided at the same place, between B and E. Why these words? Is this hard to do? Why isn't IN BED in the center? Why is the non-theme fill so poor? EDEL ADDONS ERENOW AUREOLE EDMEESE ABOO ALERTER (!?) ASSTDA OATSEED AMBS AWS ALB ISS LYS — all far less than ideal. 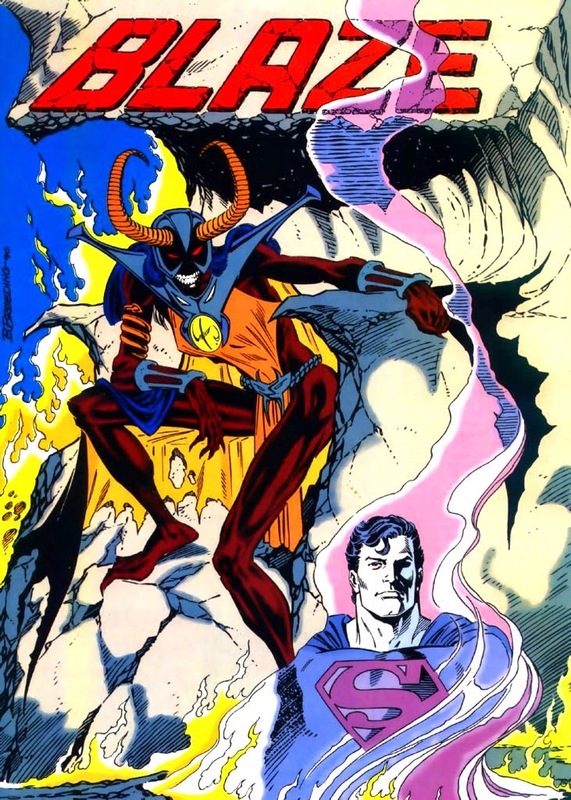 There's just not an entertaining coherent theme here. 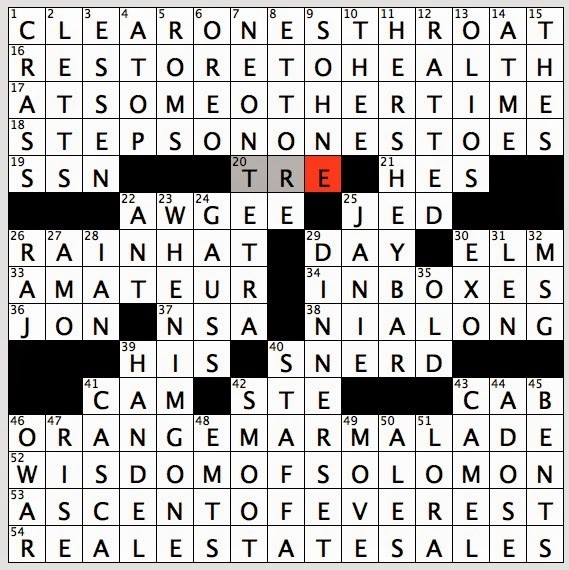 Each themer was a little word puzzle, which is fine, in some Games-like magazine or non-crossword context, but the purposelessness of IN BED, the way the resulting answers just hang out there, all naked and arbitrary and without cluing, means that there's no clear identity or point to the puzzle. Move letters around. Put words in grid. Ta da? I found it hard to care. All of the difficulty in the puzzle is related to uncovering the theme, which you (probably) needed IN BED to do. I gummed it all up from the get-go by having ALT at 1D: It's between B.C. and Sask. instead of the ALB abbrev. that was called for. 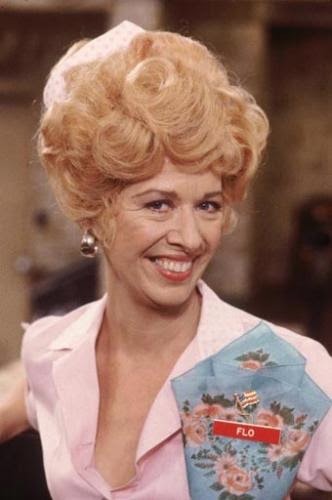 This meant I had TR-ACHED for the [*___ Motel] clue (nonsense, obviously), and even after I got IN BED, my lack of "B" there (from ALB) meant that I couldn't see what was going on until I saw ROKER inside whatever was happening at 49A: *Longtime TV weatherman. From there, I pieced the theme together, changed ALT to ALB, and got through the rest of the puzzle pretty easily. BROOMED is a word? If you have to resort to that strange a B-ED word, try try again. BROILED, BRAIDED … honestly, it feels like you could go on forever (part of the theme's problem—the utter arbitrariness of the themers). Today's wrong answers (besides ALT) included CAROMS for SERUMS (19A: Some shots), EERIER for EDGIER (28D: More out there), and, best of all, SIREN for SIDE B (7D: Rod Stewart's "Maggie May," for one). I liked ROUNDER (as clued) (29D: Habitual drunkard) and the parallel adjacency of YOKO ONO and LENNON. There wasn't a lot else to recommend here. I liked this very much. Didn't think the clues were as funny as they could've been—for instance, I like the idea of cars stuck in traffic with no tires better than the idea of a Goodyear plant simply not functioning. It's the wacky principle—if you're going to do the Wacky Thing, be Very Wacky (like, Absurdist Wacky) or don't bother. 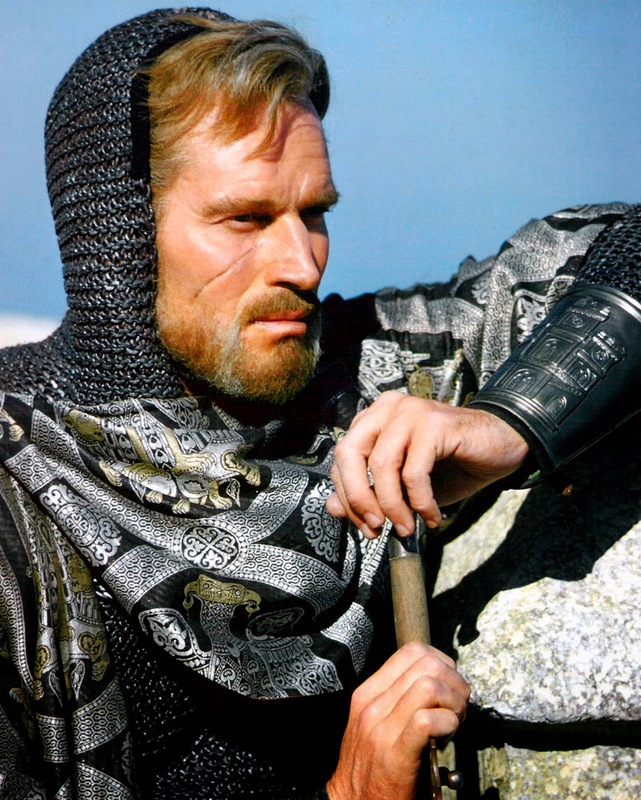 But the humor got better on LISTLESS FEELING and RUTHLESS TACTICS, so all in all, this worked well. Lovely restraint on using just the three grid-spanners for the theme answers. 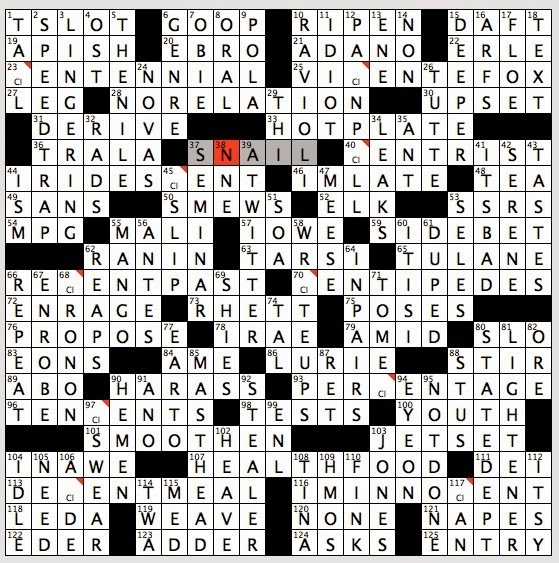 This allows for a grid that breathes, full of solid short- and mid-range answers. Clean as a whistle, this one. 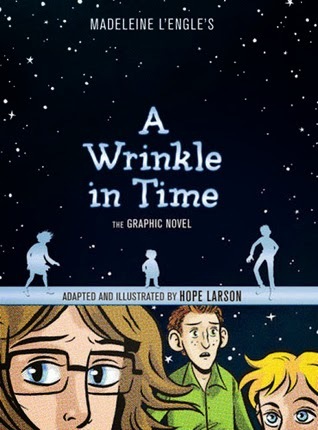 Even MRS. WHO (a complete WTF to me) earns her keep by being interestingly anomalous (8D: Woman in "A Wrinkle in Time"). This one felt old-fashioned in a good way: simple, well-crafted, fun. MRS. WHO and ELMO were my big sticking points today, though they weren't That big in the end. I never liked "The Big Lebowski" as much as everyone I know seems to think I ought to, especially considering I love (like, Love love) Raymond Chandler and that was supposed to be the Chandler installment of their crime fiction trilogy or whatever (I think Cain was "Blood Simple" and Hammett was "Miller's Crossing" … I don't know what "Fargo" was … besides Perfection). 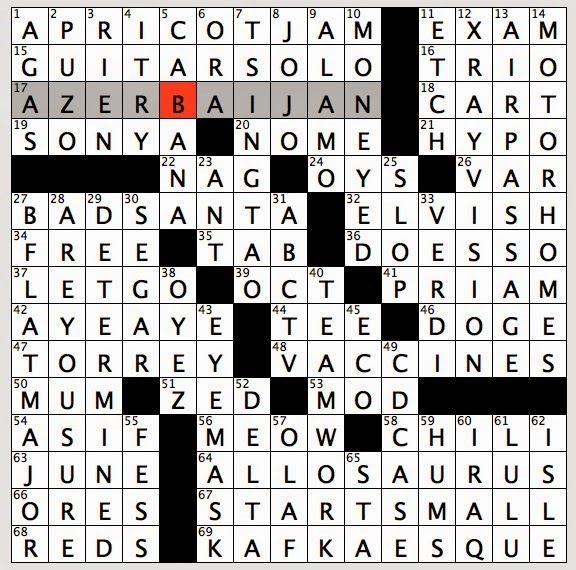 So I didn't get all atingle at THE DUDE, but I do like it very much as a contemporary crossword answer. 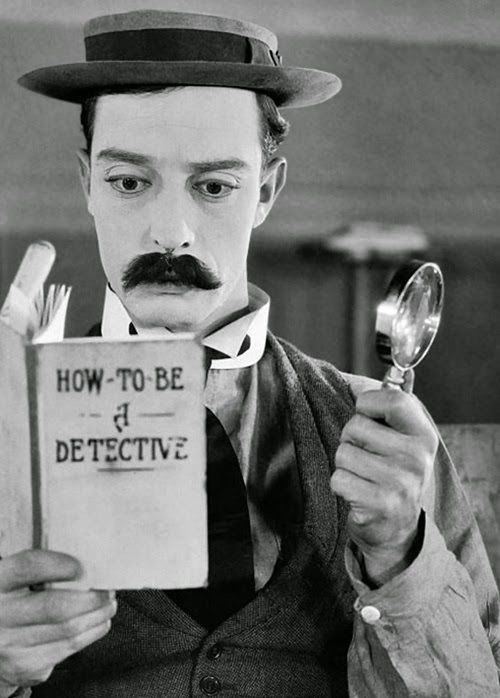 I got slightly more atingle at SLAPSTICK, as I do love Buster Keaton (38D: Buster Keaton genre). Also, BUS ROUTE, as I ride on one many times a week (just today, in fact) (9D: It may be diagrammed on a city map). LEGO LAND, also snappy (40D: Theme park based on a toy). Did not at all like the clue on GREEK MYTH, though (answer good; clue not as good) (4D: Story set on Mount Olympus). I want the word "often" to be in there. Plenty of GREEK MYTHs (most?) are set Not on Mount Olympus. It's like cluing WESTERN with [Story set in Tombstone]. Off. But again, most of this puzzle: On. 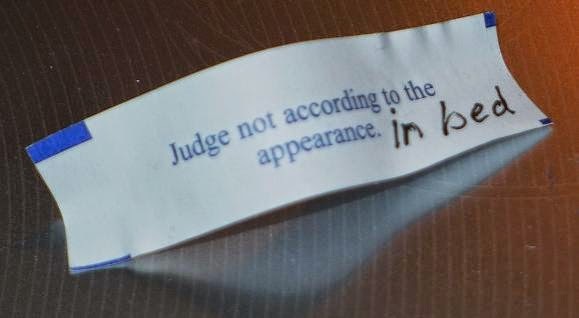 Oh, non-consecutive circles spelling out "hidden" things … how are you? I have not really missed you. This puzzle was definitely on the tough side, with the first and last themers being particularly hard to come up with, and with ICE MELT making no sense to me (even now). The charm of the puzzle seems to rest largely on the revealer, which is cute, but I'm having a hard time being impressed by the "hiding" of "subtract" in SUBCONTRACT or the hiding of "add" in anything. I actually like all the theme answers just fine, on their own. If I saw any of them in a themeless I'd say "pretty good." But the theme concept here is just OK. On the plus side, the fill is pretty nice for an early-week puzzle. Light on junk (except EAPOE, yipe), heavy on interesting shorter stuff like FJORD and BOOZE and REDUX. Several clues seemed close to gibberish to me, at first (and sometimes second) pass. First, the ICE MELT (or is it ICEMELT?) clue. Then [Sleep state for an electronic device]. I see what is meant, in retrospect, but "Sleep state" was doing nothing for me. I was imagining … some kind of alarm function … I don't know. 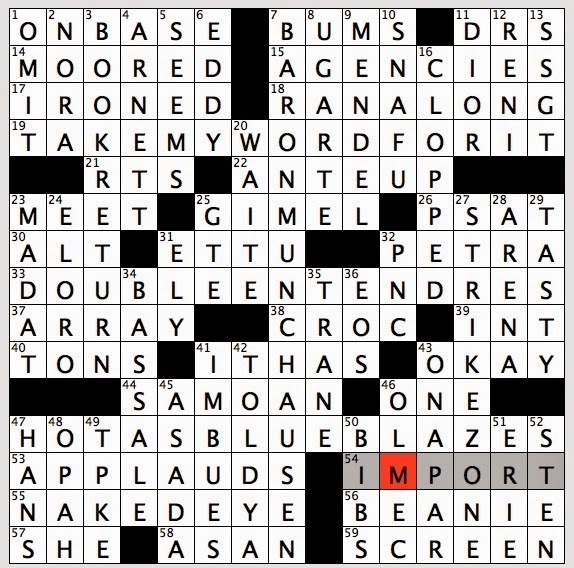 I needed every cross before I understood the clue on MORTAR (46A: What covers many blocks?). I completely forgot KENAI — just … blanked (38D: Alaskan peninsula). Front part of DRIVER'S SIDE was hard to get, and having a cross-referenced clue in one of the answers down in that corner (66A: See 50-Across) didn't help. Seemed closer to a Wednesday puzzle over all. And again, I liked the contents of the grid fine—the theme just didn't do much for me. I can't really blog adequately tonight because of the post-World Cup exhaustion I am currently experiencing. My house has never, ever been that loud … and it was just me and my wife (and the dogs occasionally running for cover because they thought we were angry, which, to be fair, we sometimes were). Also, I am currently distracted by the neighbor kid who is recently out of school and apparently has decided to dedicate this summer to dribbling a basketball for 4-5 hours a day directly outside my office window. Fun times! Anyway, the puzzle—played very choppy for me. I thought I was well on the slow side, but I still finished under 3 (if just barely), and that's a pretty normal Monday time for me. Still, grid *is* choppy, dominated by 3- and 4-letter words. This means the only grid interest is in the theme answers, which are OK. 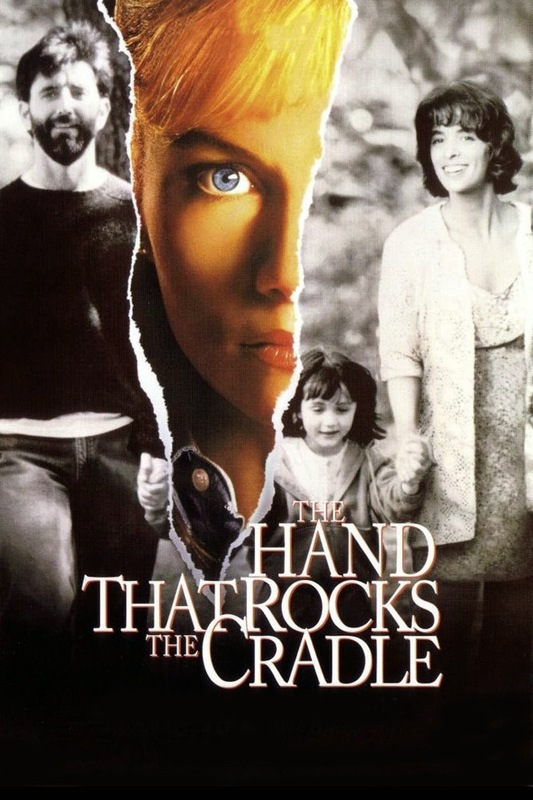 I have to call foul on "ROCK THE CRADLE," though, at least as clued. How a show *that* short-lived, *that* marginal, is allowed to be a *Monday* theme answer is beyond me. Way beyond me. If you can have [Do a chore with a pet] (however awkward) as a theme clue, then you can have [Do a chore with a child], right? The central themer is basically a glorified partial. So while I wouldn't say I WAS ANGRY with this puzzle (49A: Saw red), but it mainly just sat there … being a puzzle … but, again, I'm probably not the best judge of anything right now. My heart has stopped pounding, but the searing memory of that late goal lingers. Are there *non*-flying trapezes??? That phrase really only makes sense because of the song with the daring young man, right? Otherwise, it's a redundancy (of sorts), unless, again, there are various trapeze types of which I am unaware. 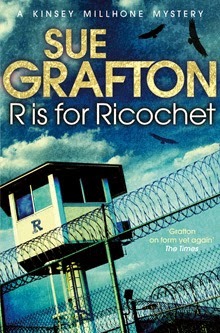 Did you read this interview with Liz Gorski last week (on the Ravishly.com website)? I forget if I linked to it here or just posted about it on Twitter and Facebook. Anyway, it's charming and interesting and well worth the read. 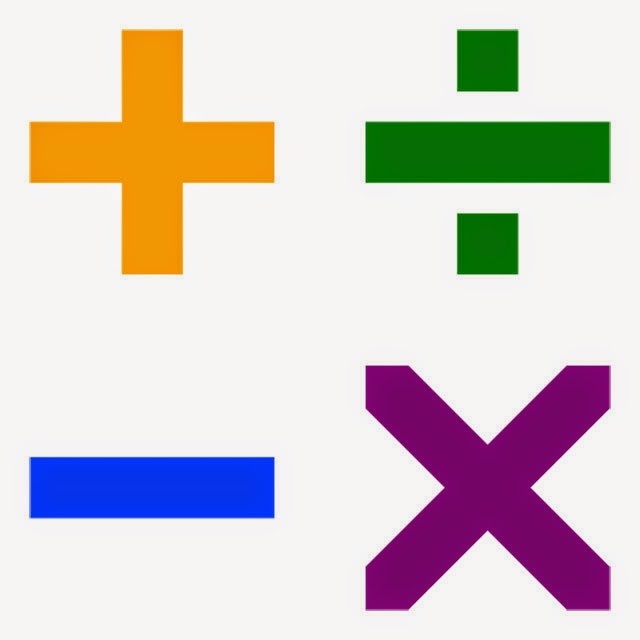 The "Challenging" part of my "Medium-Challenging" rating is entirely for the time it takes you to pick up exactly what is going on with the Across/Down, "I + C = ¢" thing. Once you get a feel for it, the puzzle plays pretty normal, maybe even a little on the easy side (since you know all those CENTS are coming down the pike). I'm a bit surprised to see this theme appear so soon after a very similar Sunday theme—Daniel Finan's DOLLAR$ AND ¢ENTS puzzle from last year, which I Loved, and which had not only the I/C rebus, but the I/S rebus (for the "$") as well. That puzzle appeared in the NYT less than a year ago (7/14/13), and while Liz's version is clearly not identical, and does have both the "Dime Store"/TEN¢ENTS angle and the "¢ENT" letter string angle (neither of which featured in last year's puzzle), still, it's a bit strange to repeat a basic core concept in so short a period of time. Anyway, this puzzle looks pretty good on its own, less good when compared to Finan's masterpiece from last year. Once you pick up the concept, as I say, things get easy, and there's not a lot of oomph left in the grid. Nothing that's going to surprise or amuse you. Just more ¢ signs. There were bits here and there that I found entertaining, like the double-rebus answer PA¢NP¢LL (12D: Percocet, for one), or the phrase NO RELATION (28A: Tyler Perry, to Katy Perry, e.g. ), which is common, but which I can't remember ever seeing before (nice clue on that one, too). But otherwise the puzzle felt pretty average, fill-wise. 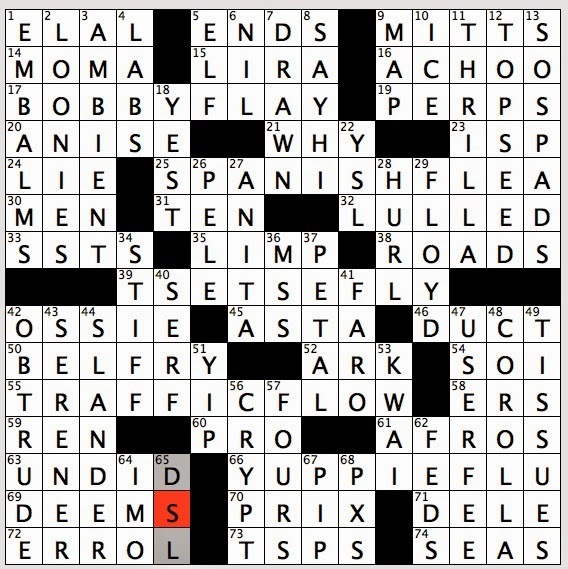 Good chunk of common crossword stuff, lots of RLSTNE words. An unfortunate pair of anatomical partials in EYE ON and EAR TO. A word I didn't know was a word (SMOOTHEN? Next you'll be telling me ENSMOOTHEN is a word… what's wrong with How is SMOOTHEN different from SMOOTH?). Most baffling answer was THI—I was happy to see that this is a standard of measurement that hasn't been used by the National Weather Service for almost 30 years; made me feel better about my ignorance. That is perhaps an initialism we should put out of its misery right bleeping here and now. for the last three weeks in pretty quick succession here. First week of June: Patrick Blindauer's "Something Is Rotten in the State of Denmark" (patrickblindauer.com)—a puzzle you can get here for free (under "Play"). It's a toughie, so A. pay attention to the title, which is very important, and B. remember that the "Solution" is also available at his site (again, under "Play"). 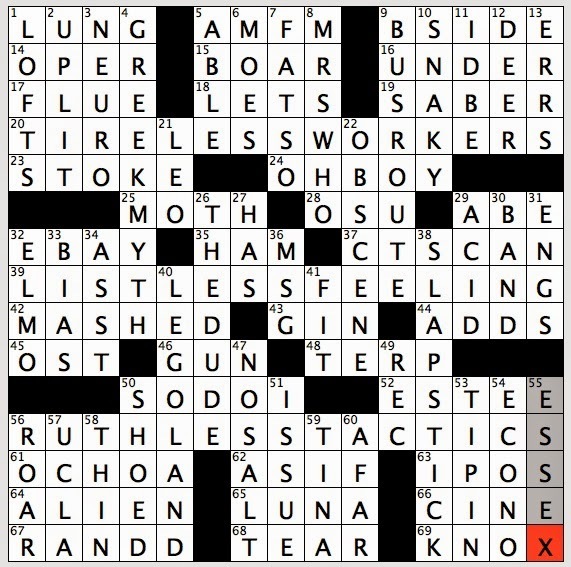 Second week of June: Merl Reagle's "The Homer That Never Happened" (Merl Reagle's Sunday Crosswords), an astonishing Sunday-sized puzzle about a familiar MYTH. Can't describe it much without giving it away. You'll want to do this one. Merl described it to me as more of a "killer find" than a "killer feat," but … well, you'll see. I see what he means, but he's being modest. Third week of June: Caleb Madison's "Put the Gun Down" (American Values Club), a smart and entertaining oversized (18x19) offering. Tricky, funny, and very contemporary. Despite two short music answers that absolutely gave me fits (Because I Am Oldish), I found this one irresistible. Get it here for a buck (or just subscribe to AVC already)— or read about it here, at Crossword Fiend. 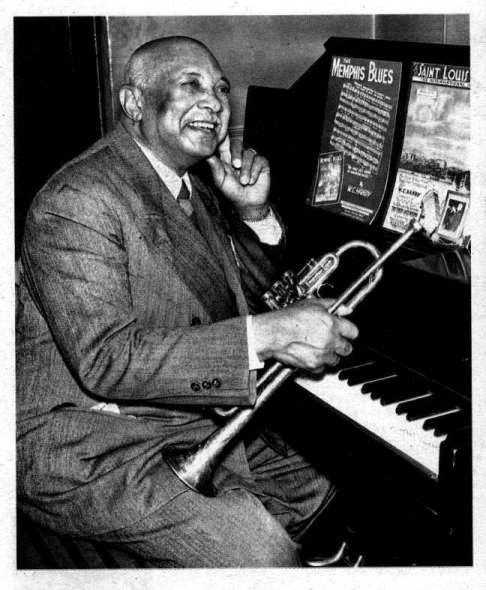 William Christopher Handy (November 16, 1873 – March 28, 1958) was a blues composer and musician. He was widely known as the "Father of the Blues". Sweetbreads or ris are culinary names for the thymus (also called throat, gullet, or neck sweetbread) or thepancreas (also called heart, stomach, or belly sweetbread), especially of the calf (ris de veau) and lamb (ris d'agneau), and less commonly of beef and pork. Still not sure exactly what "RIS" means, but I think it's a. French and b. not widely known outside specific culinary contexts. I'm torn here, in that the dishes are real things, so "RIS" is clearly a thing (though autocorrect has now turned it into "rid" half a dozen times so far during this write-up). But I'm deeply opposed to not-commonly-known foreign words. Maybe if the clue on OLDS were clearer, I would've simply forgotten about RIS. But it wasn't so I'm talking about this stupid little three-letter word instead of everything else the puzzle has to offer. 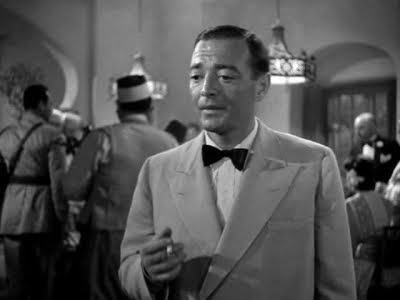 And I guess this is my point—the last thing you want is to have something off, something rankling, in the connective tissue of your grid. It is apt to leave solvers with a bad taste, and take attention away from the worthier parts of the grid. NONI (also not a great answer) doesn't bother me nearly as much as the crosses are all clear, i.e. that one word, NONI, is not going to keep me from getting any of the crosses. But I had OLD_ and I looked at the clue, 19D: Onetime Toronado, e.g., informally, and I had no idea at first what was even meant. "Onetime" means that OLDS is no longer a brand name? If that's so, then the phrasing seems off. It didn't used to be a Toronado and then become something else or enter some new state of being. I wasn't even sure the thing in question was a car. Was worried this was a historical or a sports clue and the answer was going to be OLD [some letter]. But I took a flier on the car and it worked out. And still I am talking about this little section. . . Gah! 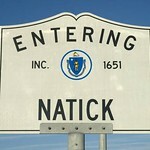 Really liked the NE—in fact, the whole eastern side of the grid is pretty nice. I'm much cooler on the west. NADERITE gets my vote for Most Original Answer of the Day (36D: Voter with a Green button, once). Crosswordese muscle memory helped me get DIONE (44A: Moon of Saturn) and ISERE (45D: River bordering the Olympic host sites Grenoble and Albertville). I wanted SOVIET ERA before STALIN ERA (29D: Setting for "One Day in the Life of Ivan Denisovich"). I got Dennis confused with what's his name, the prince … Prince Herbert, the guy who doesn't want to marry, doesn't want to inherit his father's land, but just wants to … sing! TAD LINCOLN sounds like a heartthrob, but I'm guessing he wasn't (18A: Onetime White House resident with a cleft palate). Oh, he died at 18. That's sad. Staffa (Scottish Gaelic: Stafa, pronounced [s̪t̪afa]) from the Old Norse for stave or pillar island, is an island of the Inner Hebrides in Argyll and Bute, Scotland. The Vikings gave it this name as its columnar basaltreminded them of their houses, which were built from vertically placed tree-logs. 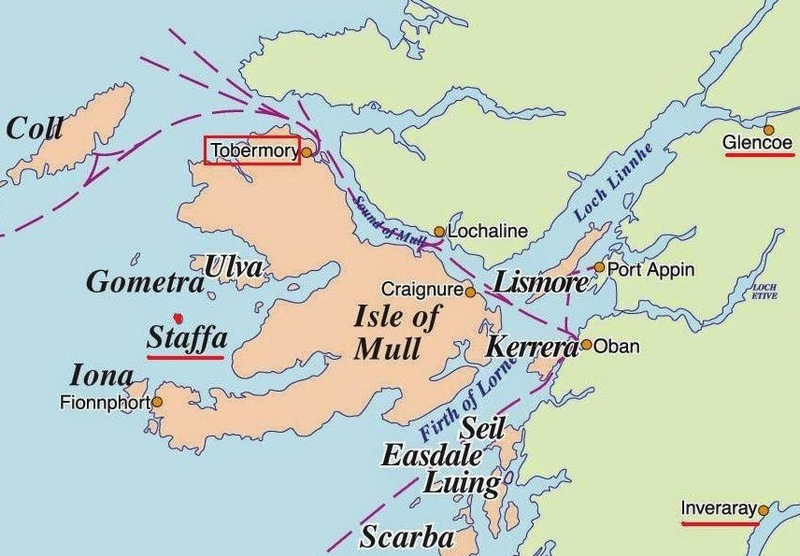 Staffa lies about 10 kilometres (6 mi) west of the Isle of Mull. The area is 33 hectares (82 acres) and the highest point is 42 metres (138 ft) above sea level. I know at this point my not liking a quad stack puzzle is not remarkable, but this one really is terribly put together. There's just no concern for pleasure or (in parts) even general do-ability. A ton of people are just going to get trounced by the absurd proper nouns in this puzzle, mainly the names LETTS and (esp.) ETTORE (!?!). Honestly, both the "R" and the "E" in TRE (20A: ___ cord (piano direction)), were, for me, an out-and-out guess. Cross your fingers, hope for the best. It's just an obscure proper noun / foreign word train wreck right there. Also, who is LORA Leigh? What is "Hug O'WAR"? What is "A DOSE of Rock 'n' Roll"? If the fill in any of these cases was actually interesting and not the kind of horrid compromises we always see in quad stack crosses, maybe. But … wow. Even making allowances for my own personal anti-stack predilection, I found this miserable. Honestly, when I saw that there were not one but two ONE'S phrases in the first stack, I just stopped trying / caring. When we invent *joke* 15s, that is the kind of crap we make up—random phrases with ONE'S in them. ONE'S is now such a huge, obvious, joke of a crutch, that unless you can make a stack without resorting to such a phrase, just give up. Give. Up. See also REAL ESTATE SALES, a flimsy answer that exists solely to provide a long string of very common letters (54A: Focus of GHTV's "House Hunters"). HES, THES, THEE, AT ME … the absurd Scrabble-f***king in the east and west … the laughably obscure STAFFA … it's beyond me. You can have it. Good + night.